Tired of the same, monotonous look day in, day out? We totally feel you. If you’re someone who thinks that short hair isn’t for experimenting with, today we’ll show you it can be. There are tons of super cute and easy hairstyles for short hair, which are quick and easy to do at home. Incredibly inspiring hair blogger Sali Rasa is making an appearance on TRHS again today to share her 10 easy step-by-step tutorials on how to spice up your cut! All you need is a bandana and a chopstick curler — or any curling iron will do. Take small parts of your bangs and start curling them. If you have thin hair and you want more volume, curl every section in opposite directions. Curl the first section toward the back and the next section toward the front. This will make the curls look more voluminous. Wrap the bandana around your head and tie it on top. Then, loosen the curls with your fingers and set this cute hairstyle with some hairspray. This style is perfect for fine, straight hair. Use a conical curling iron to get the most voluminous curls. Start with a heat protection spray to protect your hair from damage. The heat protection spray will also help your curls last all day. Start wrapping sections of hair around the iron. Be sure to take combed, smooth sections and wrap them starting from the bigger end toward the tapered end of the iron. Keep going until you’ve curled your whole head. Then brush your fingers through the curls to loosen them. This is a super-cool hairstyle for special occasions. If you are looking for a quick change but do not want to commit, how about changing the color for a day? Find these sprays at your local store or salon in a variety of different colors. My favourites are Colorista’s blue and rosegold by L’Oreal. Just style your hair as usual and then spray on the color. Be sure to let it dry for a minute and set it with hairspray to make your style last. And the best part is you can wash it off at the end of the day. It is a great option for a daily change. If you have fine or thick hair, you should always have some cute hairbands handy. Using a hairband can change the whole look. They come in a variety of styles, from sporty to glittery ones with diamonds. Style your hair with the bangs to the front and then put the hairband on. Pull out little strands and pull them to the front over the hairband instead of under. And there you are: a cool hairstyle you can change up by using different kinds of hairbands. I am using a pink pewter hairband in the picture. Using a round brush might sound a bit weird for short hair. But I discovered that it gives my hair more volume and a nicer style when I use one. I usually start by blow drying my hair using a paddle brush. As soon as it’s about 70% dry, I switch to a round, boar bristle brush. Finish the blowout using the round brush to dry your bangs backwards to give them a little extra bounce. An updo is especially easy when you have super short hair! If you have an undercut, start by styling all your hair to one side. Use a little dry shampoo or hairspray to give it more volume on top. Then, wrap your hair in a little roll exactly where your undercut starts on the other side and set it with a bobby pin or two. This is by far the easiest updo I have ever done. And it looks great! Don’t forget to set it with hairspray so it lasts all night. If you can braid you have way more options for styling your short hair with braided hairstyles. If you can’t braid, it’s never too late to learn! I have some step-by-step tutorials for you. This is a two-strand braid where you bring little pieces of the outer section under the other. Before crossing the sections, add tiny bits of your bangs to the section. Be sure to braid in the direction where you want your braid to stay. When you’ve finished the braid, spray some dry shampoo on the ends for hold. Loosen it up a little by gently pulling on the outer strands to make the braid look bigger. Secure the end of the braid with a clear elastic or set the ends with a lot of hairspray. Are you in the mood for stars? Have you ever thought of using stickers in your hair? Here’s a festive option that’s also super easy. All you need are some stickers and hairspray. 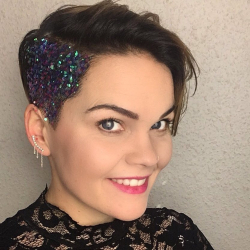 Style your hair as usual and then bring on the stickers! Wait a few seconds and then set it all with hairspray for a festive, starry style. Do you wear your hair the same way because you don’t like to use heat or other tools? What about trying just a little bit of hair wax? Apply a bit of hair wax and style your hair to the opposite side that you normally wear. It might feel a bit weird the first time, but you’ll be sure to get a lot of compliments! Here are some basic options for styles with hair wax. Bring your hair all together in a French braid. Hair is easiest to braid after a day or two without a wash. Start in the front with three sections and bring them over the middle to your other hand. Then, do the same with the other side. Once you have done this twice you have the start of the braid. Keep crossing the sections while adding a little hair from the sides every time before crossing the strands over the middle one. Whether you are a beginner or an expert in trying different styles, save these options to get inspired. Your arms might get tired, but with practice, you will get better and faster! Have fun and experiment daily! Follow Sali Rasa’s Instagram and The Right Hairstyles’ Facebook page because we make friends with the best hair bloggers!